Halo Top Creamery is a newer ice cream brand than its many competitors, but that doesn’t mean that it’s worth ignoring these days. They’ve taken parts of North America by storm, as well as more countries around the world. They made about $342.2 million in sales just in 2017, meaning that they’ll no doubt make more than that by the time 2018 comes to a close. 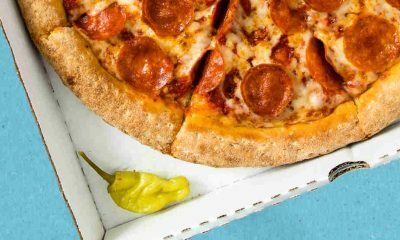 Despite their massive growth in popularity in almost 10 years since its inception, there are still many facts that consumers may not know about. Here are 10 untold truths that concern Halo Top Creamery. Justin Woolverton is a former corporate lawyer who’s based out of California. But most important, he is the founder and CEO of Halo Top Creamery. 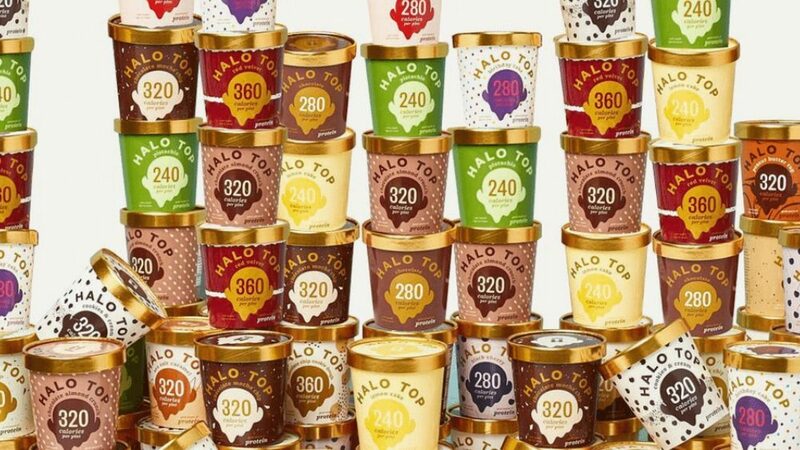 Woolverton has had issues with his blood sugar for many years prior to creating Halo Top, meaning that his diet is as low in sugar as possible at all times. He also tries to eat as healthy as possible for the exact same reason. So, Woolverton began creating the first few versions of Halo Top in his own kitchen because he wanted an ice cream for himself that’s both healthy and low in sugar. It took multiple failed attempts, but eventually, he managed to finally nail the formula. Once he realized the potential success of Halo Top, Woolverton brought in another former corporate lawyer and friend, Douglas Bouton. 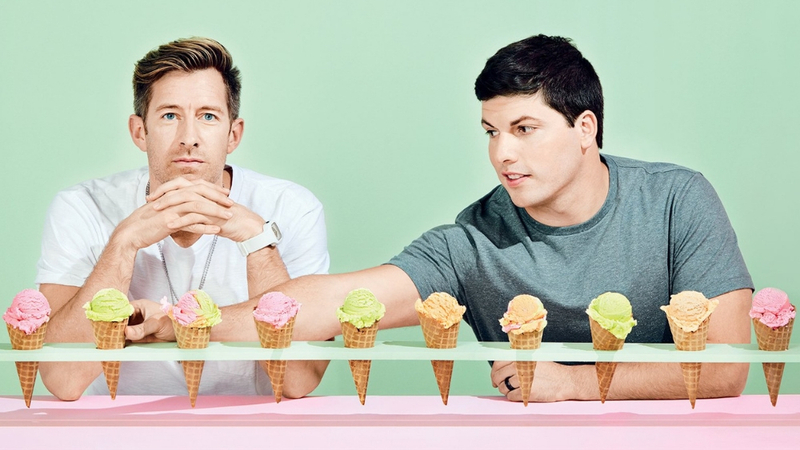 The pair worked for years to perfect the formula some more, while also figuring out the business aspect of Halo Top. Within a few short years, they managed to find plenty of success in their own right. But to think that it all started with one man’s desire to find a healthy, low sugar ice cream alternative seems almost unbelievable when you think about it today. 9. 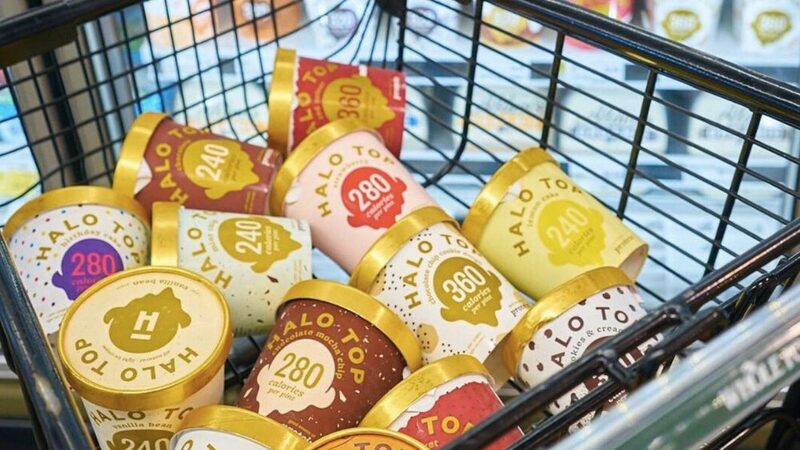 Halo Top Is The Most Popular Ice Cream Pint In the U.S.
By the summer of 2017, Halo Top Creamery had hit its stride when it came to their sales. 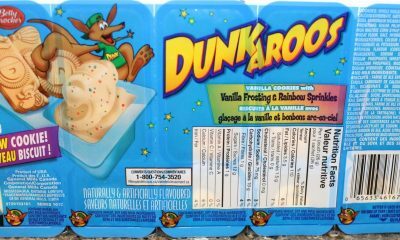 The Los Angeles, California-based company received the title of the best-selling ice cream across all participating grocery stores in the United States. What proof is there of this? Well, according to Woolverton, sales in 2016 climbed to roughly 2500% to $66 million from 2015, with more than 13.5 million pints sold at an average price of about $4.89 USD. 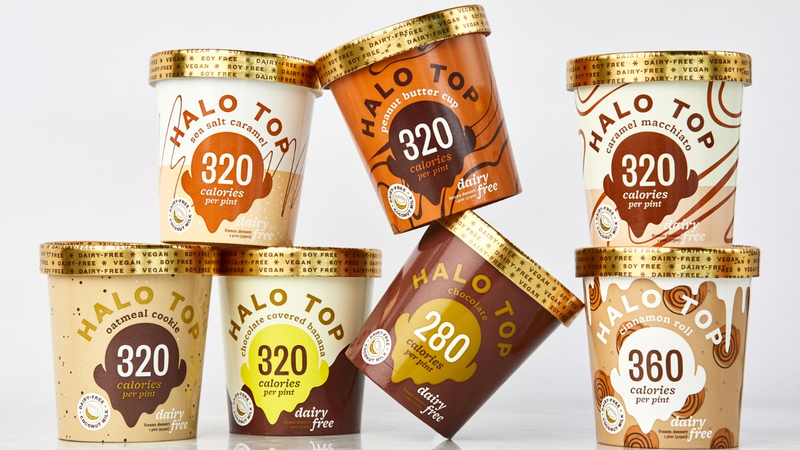 By Halo Top achieving such high numbers then- and exceeding those numbers since- they’ve managed to crush any and all competition that had previously been in their way. 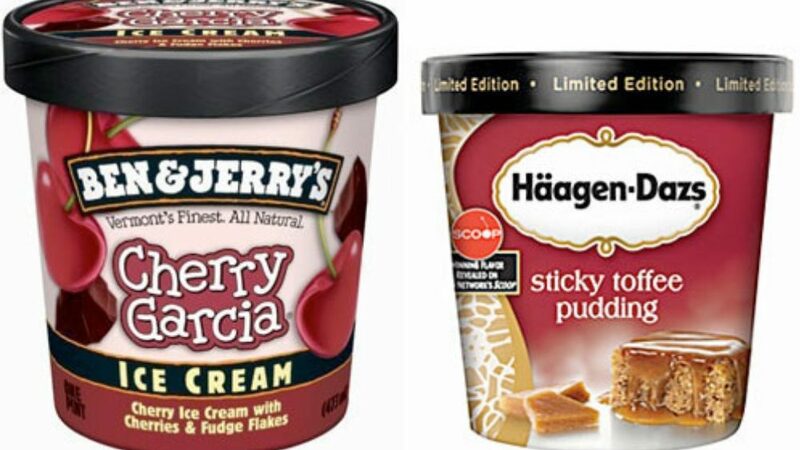 Ben & Jerry’s, Breyer’s, and Häagen-Dazs were all taken over by a newer ice cream brand that hadn’t been on the market as long. Woolverton credits plenty of his company’s success to how wonderful their fans are in buying the product like crazy. As true as that may be, Halo Top is also success because of how healthy their ice cream is, which drew fans in initially- and later made them customers for life. Halo Top Creamery got its start in the United States, but its popularity has extended far beyond its home country. 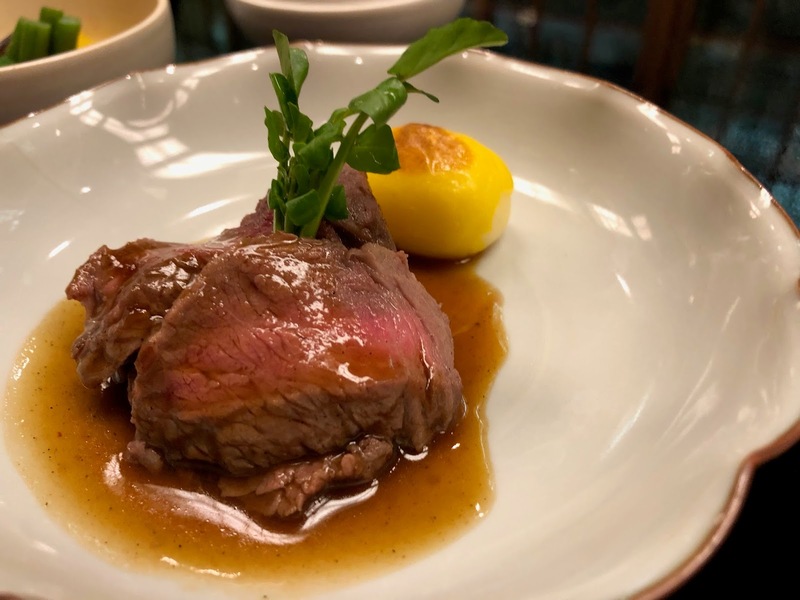 It became available in the United Kingdom back in 2017, hitting a fairly large and influential country in the heart of Europe. 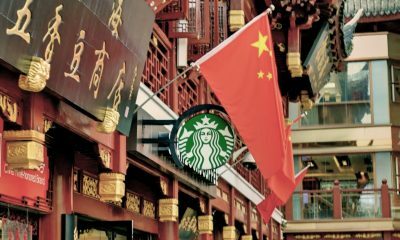 It then became available in Canada back in mid-2018, thus increasing their profits and profile in their neighbour up to the North. Other countries that now sell Halo Top include Australia and Singapore- two more large countries that have millions of citizens in their own right who will both appreciate and buy the product in question. As exciting as these expansions may be, they aren’t great news for those that don’t live in those countries. It just means that it’s not yet available for them to buy. Moreover, the flavours available in each respective country may be limited to what’s all available in the U.S. Fortunately, Halo Top has created a solution of sorts- request forms for consumers to fill out on their website to request certain flavours in their city or country. 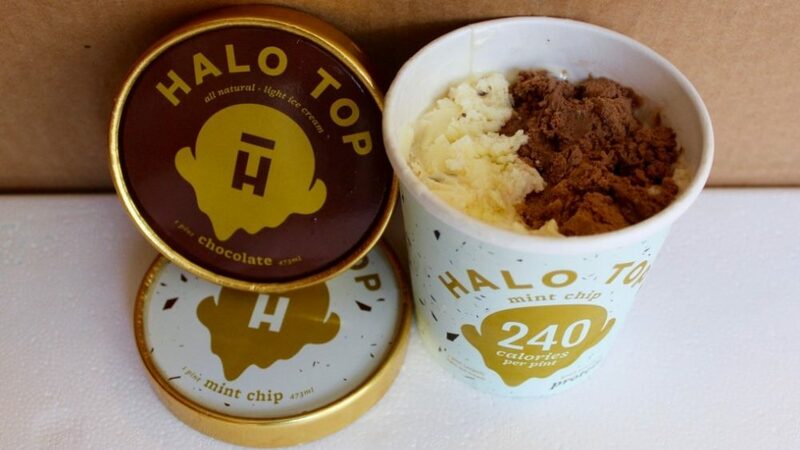 This will surely help grow Halo Top further in the long run. Halo Top sells over a dozen different flavours of their dairy ice cream pints. They have traditional or common flavours that you may expect from any other ice cream company- Chocolate, Chocolate Chip Cookie Dough, Chocolate Mocha Chip, Cookies & Cream, Mint Chip, Peanut Butter Cup, Sea Salt Caramel, Strawberry, and Vanilla Bean. 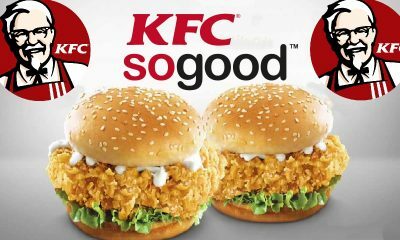 But they have plenty of unique flavours that will have you intrigued to give them a try. These include Birthday Cake, Black Cherry, Candy Bar, Caramel Macchiato, Chocolate Almond Crunch, Chocolate Covered Banana, Cinnamon Roll, Lemon Cake, Oatmeal Cookie, Mochi Green Tea, Pancake & Waffles, Pistachio, Rainbow Swirl, Red Velvet, and S’mores. If you’re vegan- whether it’s for health reasons or for personal reasons- you may be disappointed to find out that not all of Halo Top’s flavours also have a dairy-free alternative available. The only flavours that are currently dairy-free are Birthday Cake, Candy Car, Caramel Macchiato, Chocolate, Chocolate Chip Cookie Dough, Chocolate Covered Banana, Cinnamon Roll, Oatmeal Cookie, Pancakes & Waffles, Peanut Butter Cup, and Sea Salt Caramel. But there are two flavours that are available only as dairy-free options- Toasted Coconut and Vanilla Maple. With that in mind, here’s hoping that Halo Top will expand on their dairy-free flavours sooner than later. Like any other company, Halo Top Creamery runs ads in an effort to reach more people and make money. 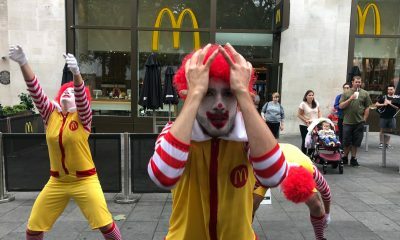 But they’ve conducted their ads in a more modern manner than their competitors. Rather than traditional ads on the radio or on TV, Halo Top focuses their ads all across their social media platforms. They push their product on their Facebook, Instagram, Pinterest, and Twitter profiles, making them look and feel less like ads and more like cool social media posts from an ice cream company. 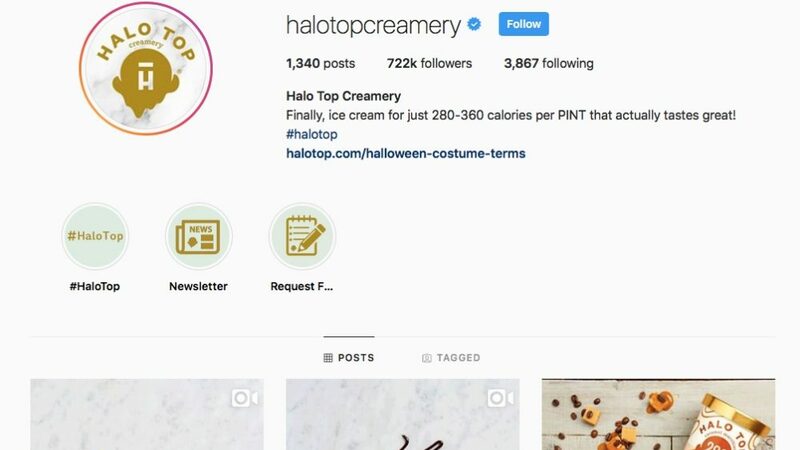 Of course, it’s not hard to see exactly what Halo Top is doing, but a majority of people seem to don’t care much or at all because the company continues to gain more and more followers across all of their social media platforms. This unorthodox yet modern approach to advertising has resulted in more attention to Halo Top, and their social media platforms as well. They currently have over 780 000 likes on Facebook, over 720 000 followers on Instagram, over 12 000 followers on Pinterest, and close to 42 000 followers on Twitter. They may not be have as many followers or likes as their competitors, but their ads are less obnoxious due to their appearance on social media. If they keep this up, it will help them gain more followers for many years to come. This is arguably the biggest selling point for Halo Top Creamery, and it is also what makes them so different. Considering that they face competition with both Ben & Jerry’s And Häagen-Daz in the world of ice cream pints, Halo Top needs to be as different as possible. What they lacked in longevity, they have surely made up for by being a far healthier ice cream option. 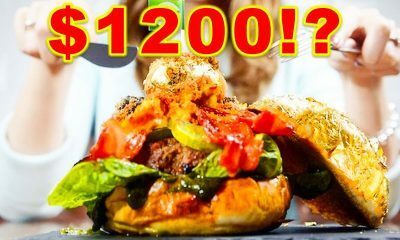 This has definitely paid off for the Los Angeles-based company- by the summer of 2017, they were outselling both competitors by a landslide. Just how healthy is Halo Top from its competitors? 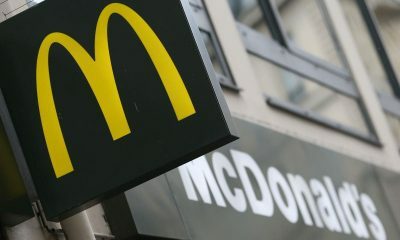 Well, a pint of it ranges anywhere from 250 calories to just under 400 calories for consuming the entire thing. Meanwhile, a pint of Ben & Jerry’s for example can reach well over 1000 calories! Add to the fact that Halo Top is generally lower in carbohydrates, fat, and sugar- and higher in fibre and protein- it’s a guilt-free ice cream option that any consumer can get behind. Given that a majority of consumers tend to consume a pint of ice cream in just one sitting, Halo Top is clearly the superior choice in the ice cream pint world. 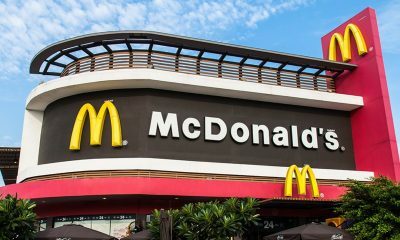 When a company grows so big so quickly, the next step that they may take is to sell themselves to a much larger corporation to make a quick buck. 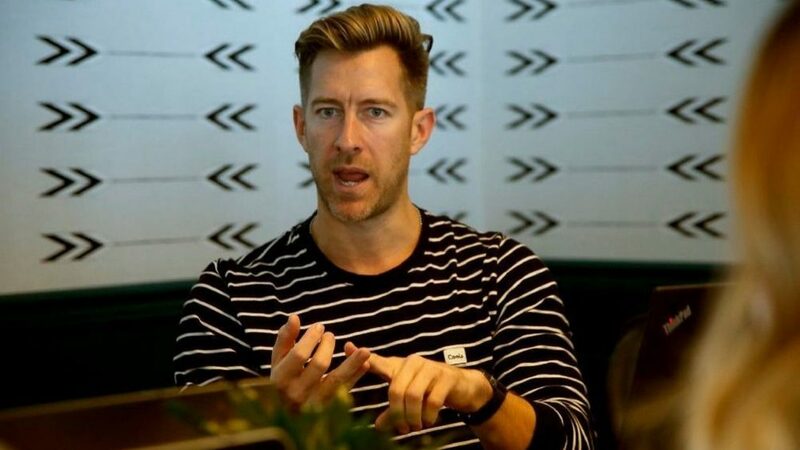 It may seem cliched and even disappointing, but it’s seemingly inevitable for most start-ups anymore. It’s not just ice cream companies, to be fair- most any company from all industries take the route of being bought out by someone bigger than them. Many companies have wanted to buy out Halo Top and take the company over, and one such company itching to do exactly that was Unilever. Unilever is a massive corporation who is behind other ice cream brands such as Breyers and Magnum, not to mention many more brands that are both in and out of the food and beverage industry. They made a $2 billion offer to absorb this smaller ice cream company into their much larger company. However, Woolverton- Halo Top’s founder and CEO- has absolutely no intention to make such a move. He turned down Unilever, as well as any other business looking to take over Halo Top. For many, this is not just a shocking move, but also a massive gamble to undertake that might blow up in his face one day down the road. But his reason for going it alone is simple: he wants his company to be 100 percent independent. 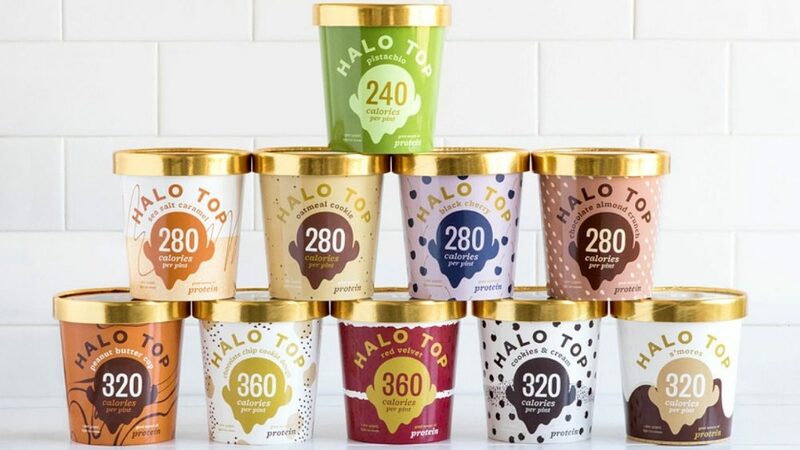 He even went so far as to say in one interview, “We’ll be as well known as Ben & Jerry’s,” suggesting that his ultimate goal for Halo Top is far bigger than what some may think. Back in late January of 2016, Halo Top was far from the well-known ice cream brand that it’s known to be today. It was still a relatively obscure company around the world, or even in the United States. At least, that was the case until a writer named Shane Snow wrote a GQ feature article called, What It’s Like to Eat Nothing but This Magical, Healthy Ice Cream for 10 Days. This article- which has since become known as the so-called “Halo Top Diet”- generated a ton of buzz across social media. It’s arguably the reason why Halo Top as a company became a huge household name seemingly overnight. As a matter of fact, they attracted so so much attention so fast that the company reportedly had trouble keeping up with the sudden demand for making and shipping out product. This GQ article clearly generated tons of traffic towards Halo Top- something that Woolverton himself was both surprised and pleased to see. Although he’d be the first to admit that following the “Halo Top Diet” may not be the best way to go about trying to lose weight. It sounds tasty, but eating nothing but ice cream isn’t healthy or sustainable for the long run. Following a regular diet is best if you’re in the midst of losing weight- along with treating yourself to the occasional Halo Top pint, of course. Many people may be under the impression that Woolverton runs Halo Top Creamery in some large skyscraper building located in the heart of Los Angeles, working 9-5 from Monday to Friday with plenty of employees working inside cubicles in the same office as him. But that idea actually couldn’t be further from the truth. Halo Top doesn’t even have a real office- rather, all 75 of its full-time employees work from their own home, and that includes Woolverton himself. Everyone communicates through the team communication app Slack, and others may meet up in WeWork-run conference rooms across Los Angeles to discuss company matters in-person. As for Woolverton, his typical work day is far from normal for any founder or CEO. He admits that he doesn’t start working until about 10:30 in the morning- far later than most other CEOS- and then proceeds to work for three hour segments at a time until about midnight. When he’s not in the middle of a three hour work period, he plays Civilization II, scrolls through Reddit, or works out. Oh, and mid-day naps are a thing for Woolverton during the day. It’s hard to imagine a better business structure than what Halo Top has going on! The main reason that Halo Top Creamery’s ice cream pints are so low in calories and therefore healthier than the competition is because of the ingredients that are used to make it. 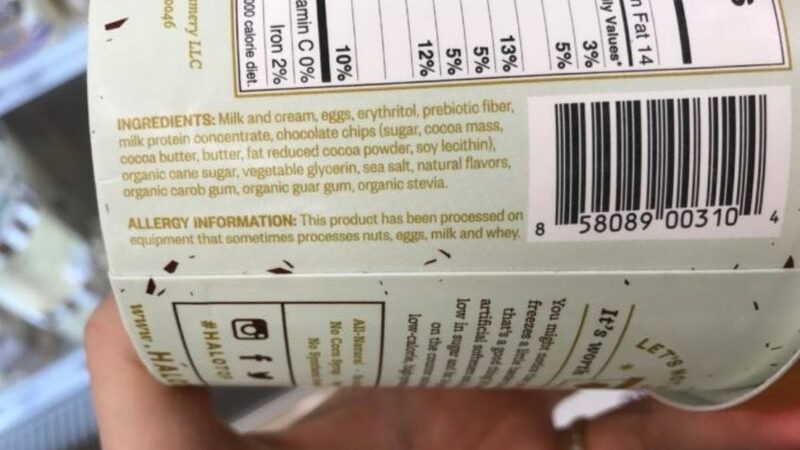 The folks behind Halo Top pride themselves in using ingredients that anyone can pronounce, and are also relatively easy to understand. This includes milk, eggs, and cream to create what could be considered the canvas of the ice cream pint. There’s also erythritol and stevia to act as a sweetener to make the ice cream palatable. 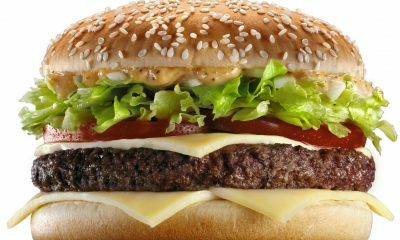 After that, the company use whatever natural or healthy ingredients will work to create the desired flavour. Some flavours like Sea Salt Caramel have to use unhealthy ingredients like corn syrup, while other flavours are able to avoid this issue.